We hope you find this bundle helpful! 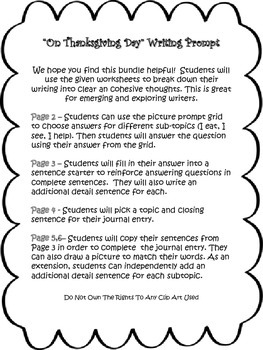 Students will use the given worksheets to break down their writing into clear an cohesive thoughts. This is great for emerging and exploring writers. 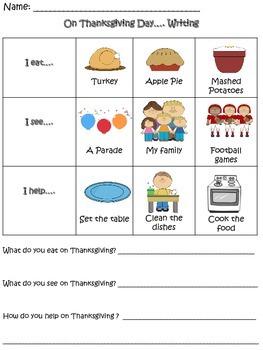 Page 2 – Students can use the picture prompt grid to choose answers for different sub-topics (I eat, I see, I help). Then students will answer the question using their answer from the grid. Page 3 – Students will fill in their answer into a sentence starter to reinforce answering questions in complete sentences. They will also write an additional detail sentence for each. 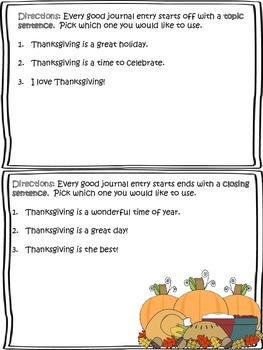 Page 4 - Students will pick a topic and closing sentence for their journal entry. Page 5,6– Students will copy their sentences from Page 3 in order to complete the journal entry. They can also draw a picture to match their words. As an extension, students can independently add an additional detail sentence for each subtopic.